I assembled a few projects over the weekend so I could spend Monday sewing. Working for a church, Easter week tends to be very busy so we get Easter Monday off from work. Well, after busily stitching all the stems and leaves on my project, I decided I really didn't like the way they looked. I was very frustrated with myself because I had talked myself into using this wool and I should have known better. I have the same theory about shopping for clothes---if I try something on and have to talk myself into buying it, no matter how great a deal it is chances are when I get it home I'll regret the purchase. 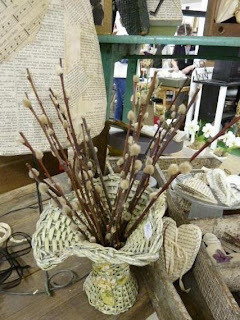 I hoped that closely stitching the wool would minimize the threadiness and give the leaves and stems a cool, primitive look, but to me they just looked messy and I was afraid the fraying would continue, so now I'll have to pull out all those little stitches and begin again! The phrase "anything worth doing is worth doing right" kept running through my head. Lesson learned? Hopefully! 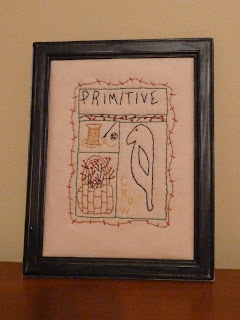 I still got to spend a day stitching and planning projects and that was fun and rejuvenating. 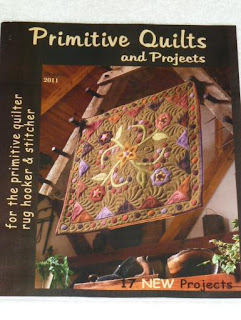 I was fortunate enough to win Kathy Schmitz's recent giveaway and received a premier copy of Primitive Quilts and Projects. Thanks so much Kathy! What a great magazine! I often browse through quilting magazines and buy one from time to time because it will have a wool project or great story about a quilt shop I'd like to visit. I'm so glad there is now a magazine that includes projects for those of us who love to do wool applique! We have an historic shopping district in Kansas City called the Country Club Plaza. It was built in the 1920's and features Spanish architecture and lots of fountains. The Plaza is particularly known for its spectacular lighting display over the holiday season, but Easter time is also special as they display several huge bunny statues throughout the district. What a fun Easter tradition. Wishing you a blessed Easter and a wonderful week ahead. Just in time for Easter, I finished a little hanging pillow from The Sampler Girl. 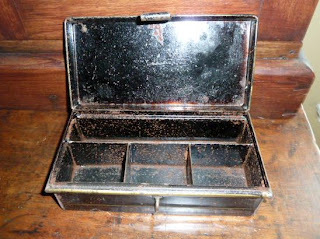 Coffee stained and finished with a strip of coordinating plaid wool and antique buttons. I also finished up my projects for this month's Simply Primitives.The spring pillow tuck is from a design by The Stitcherhood trimmed it with a soft cotton braid. Pillow itself isn't actually purple as it looks here due to the lighting, but more of a heather color. 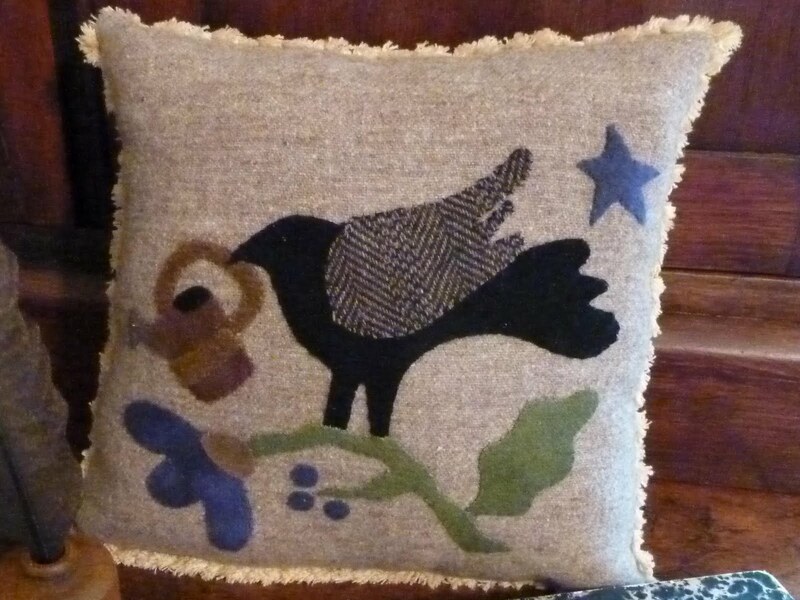 I made two versions of this Blackbird design pillow. 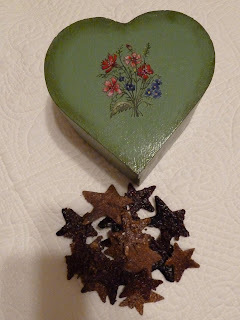 One went to Wendy for our recent swap, but I liked the design so much I made another for this month's Simply Primitives. I don't use a lot of blues in my work, but had some overdyed blue wool that really went well with the other colors used here. Over the years I've really become very particular about coordinating colors in my projects. Often, as was the case here, I'll cut out the pieces and assemble them only to realize that I don't have exactly the right shade for the project which leads to a raid of my stash to find just the right color that suits me. Still learning, though! 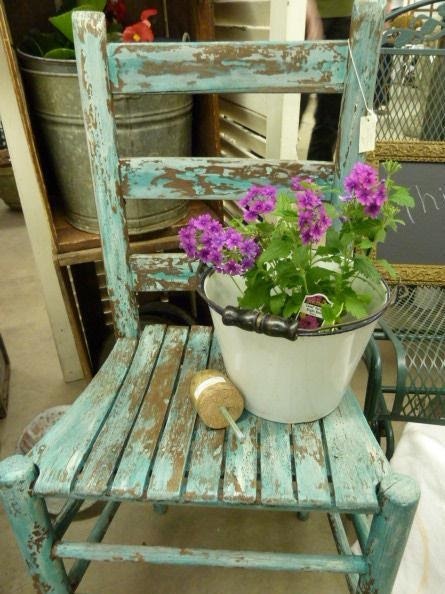 I have been anxiously awaiting Greenwood's spring antique show "On the Veranda". 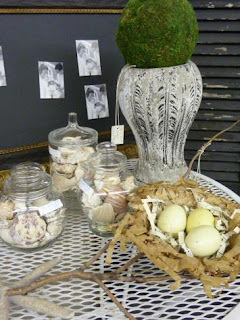 Friday was gloomy and rainy and not very spring-like outside, but inside Greenwood Antique Mall it was a different story! 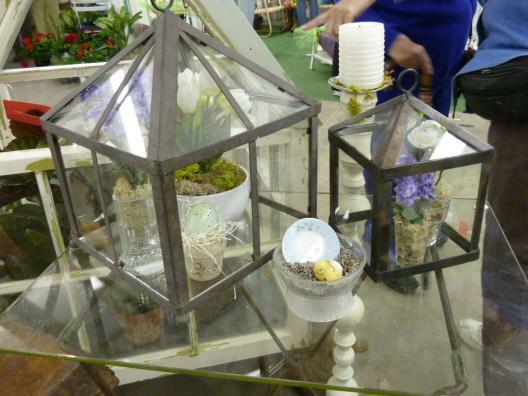 This isn't a big show, but the vendors outdo themselves with beautiful garden pieces and creative displays. Ginger's booth was full of her wonderful primitives and folded paper creations and concrete and terrariums made by Ron. After visiting the show I headed upstairs to check out the rest of the mall as well as the dealers at Greenwood Mercantile and visited my favorite shop, Old Glory and Friends. 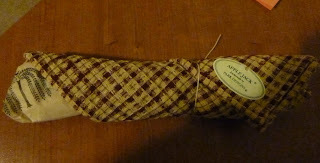 I found some old wooden clothespins to use for storing my lace trim and an old flour sack. 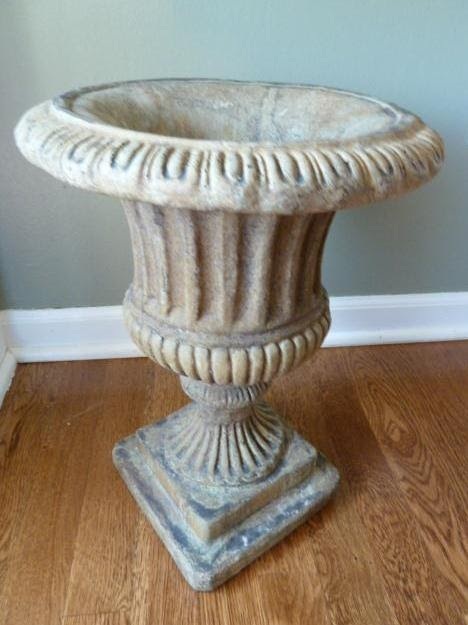 I have a weakness for concrete in the garden and claimed this charming urn as soon as I saw it in Ginger's booth. This photo doesn't do it justice. It's not a huge urn, so I think I'll use it as a centerpiece on my table on the deck. 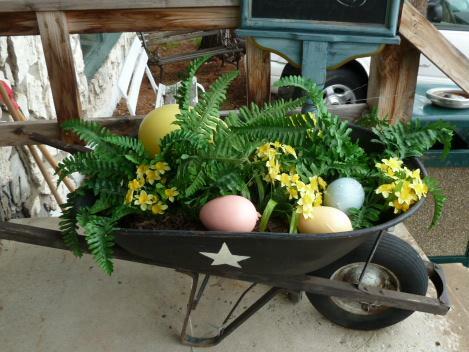 I see it planted with trailing asparagus ferns and maybe a colorful dahlia. So Me So You Swap Goodies! Tammy from A Primitive Place organized a fun swap called "This is So Me, This is So You". Our assignment was to get to know our swap partner through their blog and then send them something that we believed reflected who they are as well as something that revealed a little bit about ourselves. I was paired with the very talented Wendy at Ravenwood Whimzies and quickly realized, we really liked a lot of the same things. Wednesday evening I arrived home to find a box waiting for me and inside were all these beautiful goodies--gardening doll, stitchery picture, wood box with waxed stars, homespun dishcloth, notebook & pen, candles and a sweet note from Wendy! 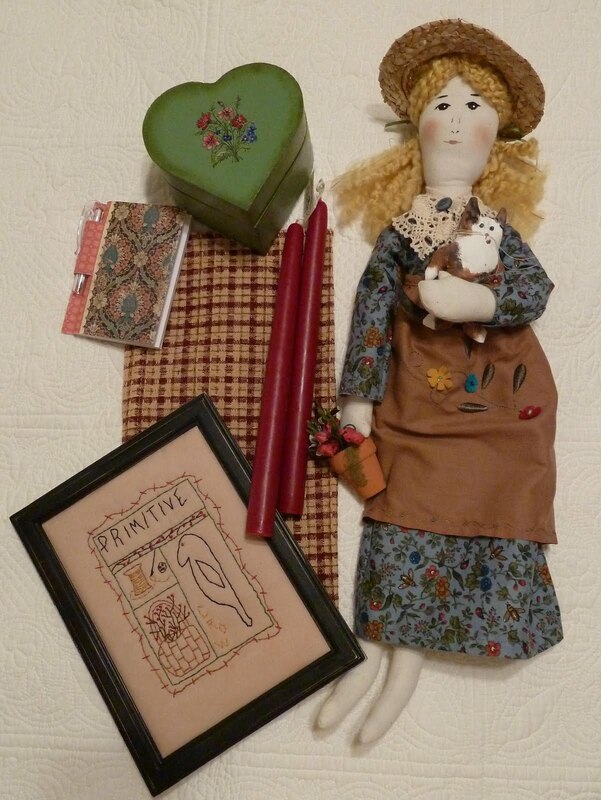 Wendy made this sweet gardening doll with me in mind. The little kitty is painted to look like our Foxy, right down to the green eyes. The stitching on the apron is just beautiful and look at her flower pot with the cross. Just perfect! 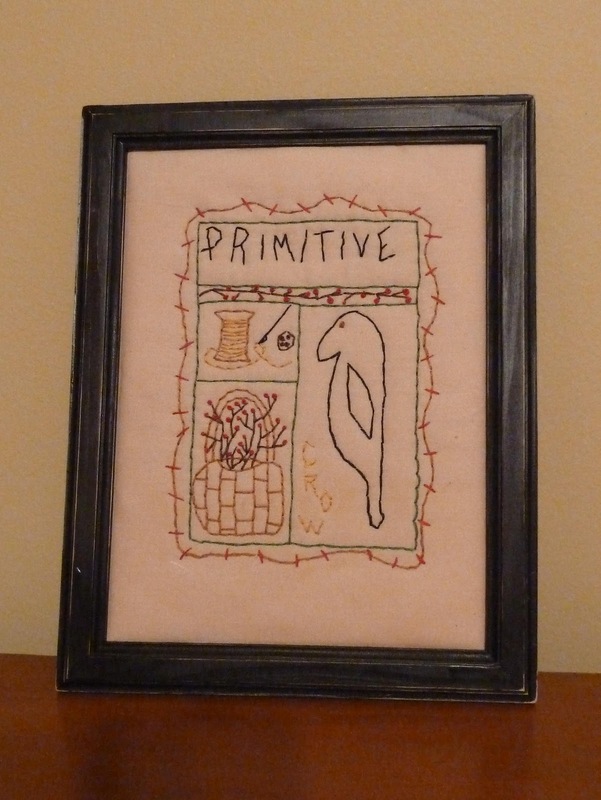 Wendy said this stitchery picture is "so her", but it also depicts some of my favorite things so I'll find a special spot for that. I also received this wonderful antiqued wood box filled with waxed star bowl fillers. Isn't that a great shade of green? 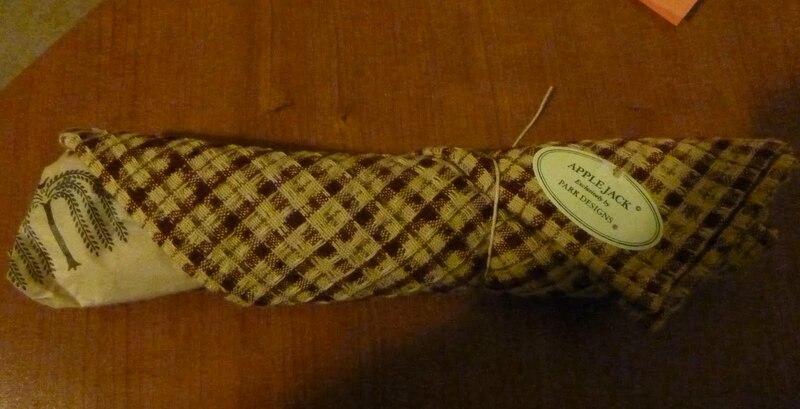 Everything came so beautifully wrapped, including this homespun dish towel---one of Foxy's favorite things to reorganize. I can't thank Wendy enough for being my swap partner. I've enjoyed getting to know her through her blog and her thoughtfulness was really a blessing. While in Texas we also spent a few days visiting my in-laws on their little "ranch". They've got a variety of animals, but the chickens really fascinate me. 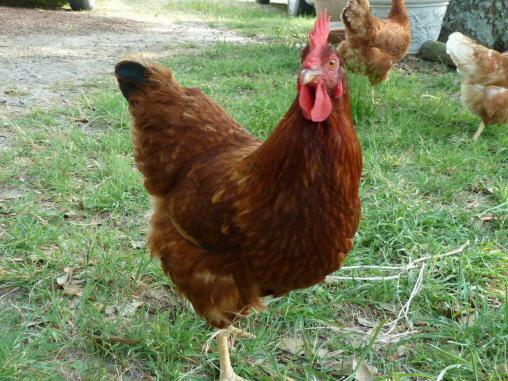 Once they're out of their coop in the morning they busily patrol the grounds, occasionally stopping for a photo op. We were with them last year when they purchased these as chicks. There are lots of hazards for chickens and my in-laws have learned never to leave their property without securing the girls back in their coop. Despite Winnie's vigilence, sometimes a hawk or coyote manages to grab one. My in-laws only have the chickens for the eggs they lay, so they become attached and losing one is always sad. At the end of they day they all return to the coop and roost. 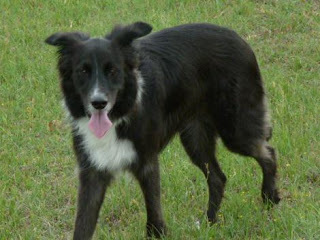 Some go to their nests and lay eggs. One is a very bad mother and just lets her eggs drop as she sits on the roost. The girls are unbelievably productive and we were able to bring home a few dozen of their fresh eggs. The yolks are a much darker yellow than our usual grocery store eggs. I don't know if its because of the variety or because the chickens are free range. Somehow, I managed to talk my husband into going to the Round Top Antique Fair for a day. Actually, he had no idea what he was getting himself into and frankly it was a lot bigger and way more fabulous than I anticipated as well. A day isn't enough to see everything. As I mentioned in a previous post, Donna provided guidance on the "must see" shows so we tried to hit all of those. We drove down from Waco Friday morning and I was somewhat surprised that we were able to hit the first shows without running into traffic, but by late morning the streets and booths were packed. Lots of beautiful booths and creative displays. Although my decorating "style" is pretty traditional with primitive accents, to me the predominant look at Round Top had a lot of European influence and romantic touches, typical of what you might find in a Stampington publication. Since this was the second to last day of the show, some of the dealers were really cutting prices. I got a cute little pillow tuck for $4 when the original price was $12! Most of my purchases were small like that, but my somewhat special find was this tin document box. They are one of my weaknesses and although this dealer had several really neat ones, I only came away with one. 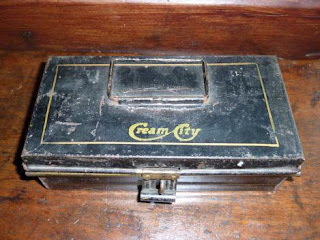 I don't remember seeing one with compartments before and I'll have to do some research on "Cream City". Any ideas?